Whether it was a headache, stomach ache or fever there was an herbal remedy for it in Tudor times. A mixture of sage, lavender and marjoram was recommended to treat a headache. If you had more of a stomach ache then chamomile was the simple cure. Nowadays ginger is a common remedy for nausea and stomach issues – so it would not surprise me if ginger was also used. Now when it came to making these remedies it wasn’t just men who made them – Tudor women would have also known how to make herbal remedies known as ‘simples’. Author Seamus O’Caellaigh’s book Pustules, Pain and Pestilence – Tudor Treatments and Ailments of Henry VIII covers some of the theories in diagnosing one’s health issues. He states that physicians from the 16th century use theories as tools to diagnose a patient’s issues. I must be upfront about this – modern medicine has deemed these all invalid but they were used into the 1800s. This included Humoral theory, doctrine of signatures, uroscopy and astrological theory. If you ever watched “The Tudors” then you know it was common practice to ‘bleed’ someone to balance one’s humors. Nowadays it seems completely ridiculous, but back then it was common practice. What did they think they were doing exactly? Well, I’m going to try to explain to the best of my ability. Blood: also known as the Sanguine humor, is the red hemoglobin-rich portion. Phlegm: also known as the Phlegmatic humor, is present as the clear plasma portion. Yellow Bile: also known as the Choleric humor, is present as a slight residue or bilirubin, imparting a slight yellowish tint. Black Bile: also known as the Melancholic humor, is present as a brownish grey sediment with platelets and clotting factors. A doctor would attempt to help their patient bring back balance to their four humors either through herbal treatments, changes to the environment (not sure what that means exactly) and blood-letting. Now the doctrine of signatures is another interesting concept. This goes back to the belief that God made certain plants to be used help us heal. It was believed that if a plant looked like a body part that it should be used to help aid in treatment of what ails the patient. For example, Eyebright was used for eye issues. Now, I’ll be honest, I just looked up a picture of the Eyebright flower to see if it resembled the human eye and I do not see it at all. So, I can make fun of these methods all I want, but in the time of the Tudors this all seemed legit. How about uroscopy? I’ve heard of this man times from watching period pieces. This is where the doctor would exam one’s urine…by smell, taste and even site. They believed that if a person’s urine was cloudy and milk-like that it could indicate a UTI, or urinary tract infection. If the urine tasted sweet it indicated diabetes. If the patient’s urine had a brownish tint then the patient would most likely have jaundice. If the urine was red and/or foamy the patient was suffering from kidney disease. If the urine had blood in it the patient was suffering from tumors in the urinary tract. Lastly, the fourth way to diagnose an ailment was by medical astrology. If you’re like me when I first read it you’re probably saying, “WHAT! ?” Nowadays someone might ask you in light conversation what your sign is. I’m a Libra, which is Tudor times was connected to one’s kidney’s and well…rear end. It was required by law in the 1500s for a physician to look at a star chart and calculate the location of stars before moving forward with any procedures like bleeding someone. In 1514, King Henry VIII is believed to have contracted Smallpox, just as his daughter Elizabeth had in 1563, but it appears Henry was spared from any scaring. Anyway, one of the absurd treatments or cures for the disease was thought to be hanging red curtains around the patients bed. If only it were that easy. Instead the patient was more than likely treated for each of their symptoms. One treatment for fever, one for a sleep aid, one for treating the pustules and one for treating the scabs. If you’re interested in learning more specifically what was used in these instances I’d highly recommend buying Pustules, Pain and Pestilence by Seamus O’Caellaigh. Let’s step back a minute – Tudor medicine was practiced by three different types of specialist: physicians, surgeons and apothecaries. Not to mention a variety of healers, midwives and of course outright quacks. Now the physician was the most respected of the bunch and they rarely “saw” their patients, instead they would diagnose an illness though uroscopy, or testing one’s urine. The surgeon was below a physician in status. A surgeon had very little formal education and learned best by performing operations at the direction of physicians. The apothecaries also had a lower social class then the physicians but the apothecaries were the ones who essentially filled the physician’s prescription. As usual, women were not allowed to practice medicine, but man women did have some basic training and they could serve as healers and midwives. If you’re a fan of watching Outlander (like I am) you would already know this because Claire was often looked at as a witch for practicing – all because she was a woman. God I love that show – can’t wait for the next season! 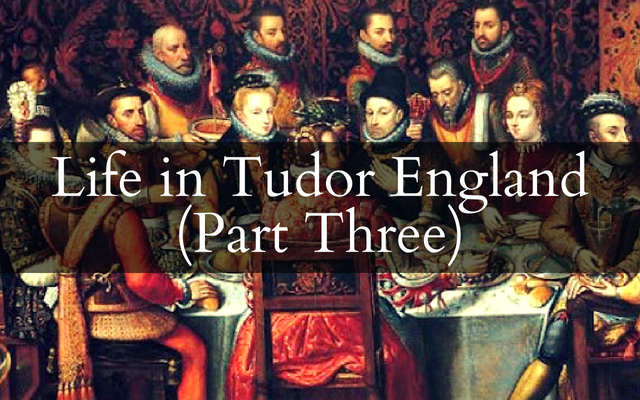 Since I just spoke of the hierarchy of those involved with medicine, I thought this was also a perfect time to speak about titles in Tudor England. Now, before I get started, I’m sure you can tell that I’m American – so learning all these different titles and names has not come as easy for me as it would to someone who grew up with this history. The only titles we have here are ones involved in government – President, Vice President, Senator and the list goes on. Then we are the old, Mr, Mrs, Miss, and Ms. all of which I think (personally are unnecessary). I’m married but I would never use Mrs. Larson – seems like a title the older generations used due woman’s roles. I prefer Ms. IF I have to choose one. So how did the hierarchy work exactly? Being addressed as “Sir” was a common address for those holding the title of knight. If someone is called Sir Francis Bryan, one can assume that he at least holds the title of knight. Your Grace was only appropriate for those with the rank of Duke or higher. As an example, “Your Grace, the Duke of Suffok”. Your Highness was the correct address for a member of the royal family. King, Queen and probably their children as well. Your Majesty was reserved for use with the monarch only – Your Majesty, King Henry. Let’s talk about gentry. The gentry had land holdings but were generally smaller and more concentrated to a geographic area. Now, officially a gentleman was a man who had the right to a coat of arms. They did not engage in productive labor, and they often owned and rented out land for others to work. Those who were called gentlemen generally had homes of six or more rooms and had several servants whose focus was personal domestic service. After the yeoman come the husbandmen. I’ve always thought this name was odd. A husband is someone you’re married to – a husbandmen is someone who farms their rented land. This would be small-scale land. Their homes unlike their betters were generally only two rooms and most of the labor came from within the family. So…I grew up on a dairy farm. My husband rented the land from his mother and my siblings and I (along with some relatives on occasion) helped him farm the land. At the bottom of the totem pole were laborers. These men (primarily men I’d say), held no land at all but had to hire themselves out to their social neighbors for a daily wage. Generally lived in a single-room home and unfortunately had a diet rich in bread.